Manufacturer of a wide range of products which include chicory destoning. Manufacturing and trading of supreme quality Chicory Destoning has helped us achieve a very high level of trust in the market. These are made available to the customers as per the set industrial standards. This helps when harvesting in wet conditions as the harvester can drive on a row of stones which helps improve traction. They remove stone using a series of webs. The stones stay on the web and the clay falls through it. The stones travel through the machine and the bigger stones fall into a boulder box and the smaller stones fall onto a cross conveyor and in turn fall into a trench. Avity Agrotech has developed highly efficient DE-stoners for the separation of stones, mud balls and other heavier impurities from dried chicory cubes to give a pure product of chicory cubes. 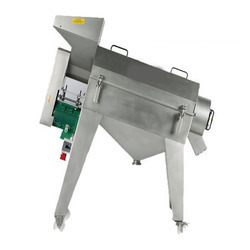 For capacities up to 2000 kgs per hour, the pressure type DE-stoner is used. For capacities of 3000 to 5000 kgs per hour the vacuum type of DE-stoner is required. A complete range of cleaning and de-stoning machinery is available for capacities up to 5000 kgs per hour. Looking for Chicory Destoning ?